Honkalintu has the enjoyable service package for small and large groups in your chosen conference site in Southern Finland. Many of the conference mansions serve as places for Honkalintu to create experiences in connection with business training. Nuuksio Nature Park has unique nature that provides perfect surrounding for an adventure close to the capital, and delicious meals prepared on campfire by Honkalintu’s chef complete the perfect day in nature. Wellbeing at work and kick off events are one popular part of Honkalintu event programs. Do not hesitate to ask more information, if you would like to get more information about the programs. ﻿In Nuuksio National Park you can enjoy nature experiences away from the hustle and bustle of the Helsinki metropolitan area. Nuuksio is well fitted for full day events or for a short trip in connection with business training events. In connection with longer hiking events, such as recreational days, we offer a possibility to enjoy your meal in nature, and offer coffee prepared in a pot over open fire. ﻿Finnish nature provides experiences all round the year. Enjoy nature in connection with conference and training events, with good friends or bring your foreign business clients here. Honkalintu has got tree transportable traditional Lappish kota tents providing space for up to 300 people. During the cookery course our chef with their team teaches the group to prepare traditional foods over open fire, such as salmon and potatoes cooked beside embers, onions, wild mushroom soup and Finnish flat bread. For dessert we make flamed pancakes and prepare coffee in a pot over open fire. ﻿Nuuksio Nature Park has unique nature that provides perfect surrounding for an adventure close to the capital, and delicious meals prepared on campfire by Honkalintu’s chef complete the perfect day in nature. If you would like to get more information about the programs, click the program you want to know more about. Nature Mobile Adventure – the ultimate teamwork game. No sweat or tears. Mobile Adventure for the great outdoors nature or the city's heart rate will bring energize your teamwork. You can also customize your own adventure with our help. 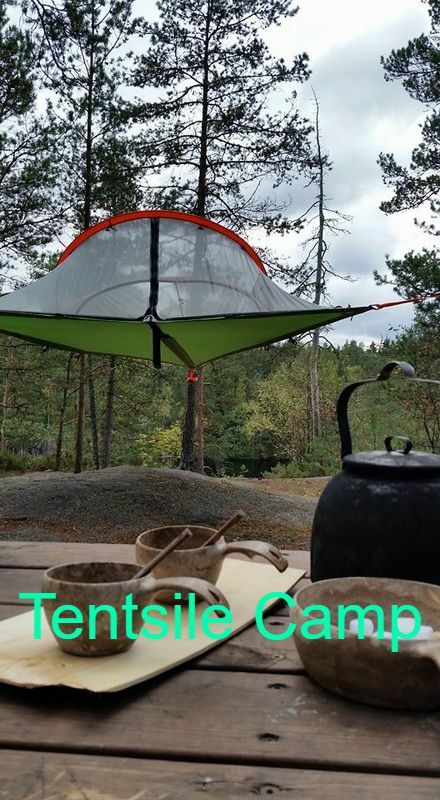 Tentsile Tree Tents were conceived as treehouses that you can take anywhere. Our "tree tents" offer an incredible new way for you and your friends to experience a whole new level of Freedom. Separated from wet, lumpy, bumpy, uneven ground and with increased protection from snakes, bugs and other creepies, our range offers the opportunity to camp in places no one has ever camped before. We have opened an EcoCamp area in Nuuksio National Park, which will be the most ecological carbon footprint friendly site in the world. It is the greenest area for Eco Camp and is called ”Night in the Tree”. It is a very ecological way to experience nature via a new experiential tree tent experience ”Night in the Tree”. Eco Camp creates a unique link in with nature and the environment.